However, understanding the difference between monthly payments is far more complex than simply comparing rental fees with a bank projection for a monthly mortgage payment. Homeowners are responsible for a few extra home costs that don't apply to renters, including insurance, maintenance, taxes, and fees. Variable rate mortgages add even more complexity to the equation as monthly repayment fees can change from month to month or year to year. In this article, we'll show you exactly how to compare the cost of owning a home versus paying rent in an "apples to apples" situation. Let's imagine you're currently paying $1,000 a month for a two-bedroom apartment. How much house can you afford for the approximately same monthly cost? 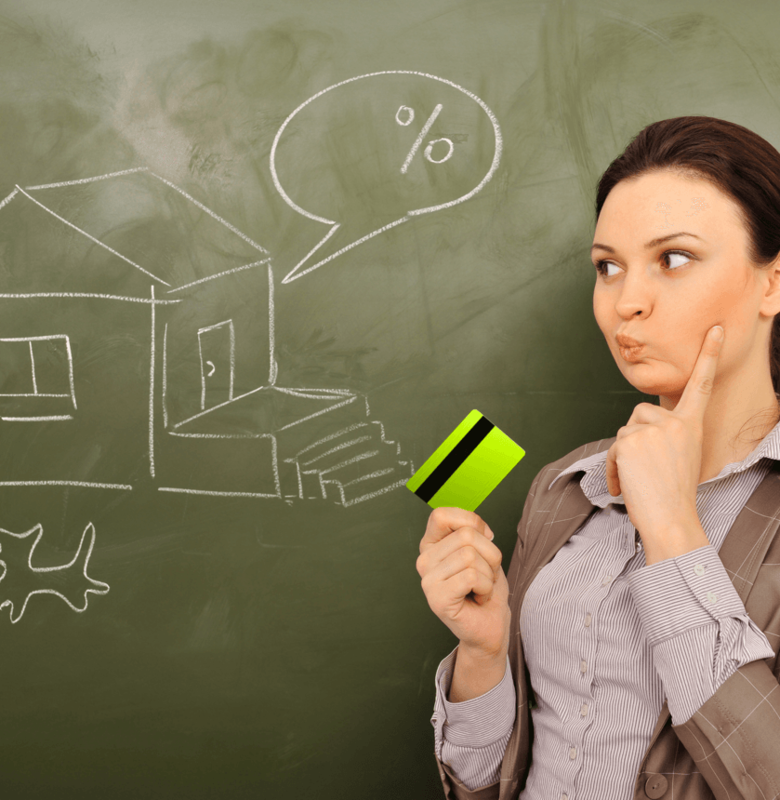 First, you need to calculate your down payment. Canadian law requires a down payment of at least 5%. But for prospective homeowners who can put down 20% or more, there's no need to also pay mortgage insurance. A 20% down payment on a house costing $270,000 would be $54,000. This would mean you'd need to take out a mortgage for $216,000. If this is a fixed rate mortgage (meaning the interest rate remains the same) at a rate of 3.76% for a term of 30 years, the monthly mortgage payment would be right around $1,000, exactly what you're already paying in rent. But you also need to calculate in property taxes, utilities, and other fees, which would average around $600 a month. This means your actual out of pocket monthly expenses would be around $1,600, with $1,000 going to pay off the mortgage and the rest for taxes, utilities, and other assorted fees. Keep in mind, however, most banks only offer 30-year mortgages for down payments of at least 20%. Conversely, if you're only able to make a 5% down payment on the same house (that lists for $270,000), you'll be locked into a shorter term mortgage that will have to be renewed and renegotiated. With a 5% down payment ($13,500), you'll need to borrow $256,500 to afford the same house. You'll also have to get mortgage insurance, which will cost $10,260 a year, making your total repayment sum $266,760. As such, your monthly mortgage payment for a five-year loan would be $4,880, even without including any utilities, taxes, or other costs. Now let's imagine you're paying $2,000 a month in rent and you want to know if it would be financially advantageous to buy a $270,000 home. If you save a down payment of 20% ($54,000), you'll need to borrow $216,000. Since you won't have to pay for mortgage insurance, you'll only be on the hook for the mortgage payment. And since you put down 20%, you can take advantage of 30-year terms. Assuming the same 3.76% fixed interest rate, your monthly mortgage payments would be just $998, less than half of what you're currently paying in rent! Indeed, under all the same conditions (20% down payment, 30-year term, and 3.76% interest rate), you can actually afford a home valued at $541,000 and still pay the same $2,000 a month (not counting utilities, taxes, and other miscellaneous costs). Even with a 5% down payment, which includes a mortgage insurance premium of around $15,000, you could afford a home valued at $394,000 and still pay the same $2,000 in monthly repayments (again, not counting taxes or other costs). If you're currently paying $3,000 in rent, what kind of house can you buy for the same monthly expenditure? Assuming the same 3.76% interest rate (which may be available at even lower rates, depending on the bank or financial institution), a 20% down payment, and a 30-year term, you can afford a house valued at $811,000. Even with only a 10% down payment and including the mandatory mortgage insurance, you could afford a home valued at $630,000 with a 25-year mortgage while still paying the same $3,000 per month (not including taxes and utilities, etc). It's important to understand the above calculations are only approximations of what's available. Banks and lending institutions offer an array of rates, terms, costs, and repayment schedules. Some banks offer special offers for the first five years that later increase while others offer variable rate mortgages that can get cheaper over time if interest rates drop. Furthermore, your ability to borrow money will depend on your credit score and credit history. It's also important to understand mortgage payments get cheaper over time, even if the dollar amounts don't change. For one, inflation ensures it gets easier to pay your monthly mortgage over time. And every time you pay your mortgage, you're building up equity in your home. This gives you access to credit at far lower rates, making it easier to borrow money in the future to continue paying off the original loan. Therefore, a strictly "apples to apples" comparison based on monthly costs alone is not the only thing to consider. A slightly lower monthly rental payment may be more cost-effective in the short run, but investing in your future by buying a home can mean it is more financially advantageous in the long run even if you have to pay a bit more every month for the house of your dreams.